It was big-time boxing at Scotttrade Center last night and the hometown boxer won. 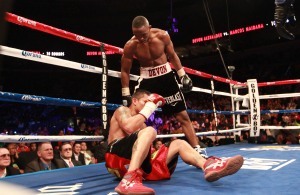 Devon Alexander, in his first fight in the 147-pound division, used the added weight to record a unanimous 10-round decision over Marcos Maidana. Alexander, a St. Louis native and former WBC and IBF junior welterweight champion, improved to 23-1. Maidana, who hails from Argentina, fell to 31-3 in his welterweight debut. The 25-year-old Alexander dominated the non-title bout, capturing nine of 10 rounds on two judges’ cards. He finished with advantages of 100-90 100-90, 99-91. Alexander, a 2-1 favorite, recorded a second straight win after his lone loss, a 10-round setback against Timothy Bradley on Jan. 29, 2011, that cost Alexander his belts. Alexander outpunched Maidana 168-93 and held a 149-85 advantage in power blows. He used a series of combinations to back Maidana into the ropes in the sixth round. In the co-feature, Adrien Broner retained his WBO junior lightweight title with a fourth-round knockout of Eloy Perez. Broner, from Cincinnati, improved to 23-0 with his 19th KO. Perez, 23-1-2, is from Salinas, Calif. Broner used a pair of rights to knock Perez on the canvas. Perez staggered to his feet but immediately fell again at the 2:24 mark. Broner connected on more punches, 58-26.